Strengths help children learn, grow and become the best they can be. With 40 brand new illustrations and 14 new strengths statements, we hope the third edition of Strength Cards for Kids will bring delight to children and adults alike, and will help build a culture of strengths wherever they go. 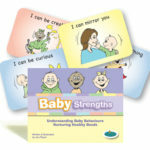 Strength Cards for Kids has a simple message: all children deserve to be recognised and celebrated for their strengths. Strengths help children learn, grow and become the best they can be. Children thrive with encouragement; they blossom when their strengths and efforts are noticed. 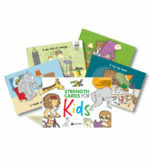 Now in its third edition, Strength Cards for Kids features a mixed bunch of raucous, funny, serious, quiet, loud, big, small and rather outrageous animal characters. They get up to all kinds of antics, most of which you will never see when you are visiting animals in a zoo, park or sanctuary. That’s because—as any child knows—animals only do these things when humans aren’t looking. A meerkat on surf life-saving duty. These are the kinds of activities you will see in Strength Cards for Kids. You’ll even see a little monkey crying and that’s because sometimes things can get tough. Thank goodness for the caring hug of the baby elephant. Everyone needs a friend like that. Why are the animals doing all these things in Strength Cards for Kids? Well, apart from having a huge amount of fun, they are demonstrating their strengths! And everyone has strengths, including us humans. 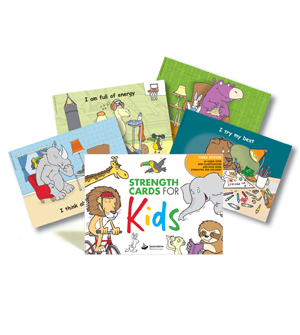 Since 1996, Strength Cards for Kids has been an asset in the toolkits of psychologists, social workers, teachers, student welfare coordinators, chaplains and counsellors. This new edition allows professionals and parents to use the ever-popular jungle theme as a prompt for stories, murals, group activities and creative play—to share those all-important, strengths-based messages! NOTE: The previous edition of ‘Strength Cards for Kids’ will remain available from Resellers until sold out. Stickers from the previous edition are also still available at a discounted price. Focus on what children can do, not what they can’t. Turn difficulties into strengths children are developing. Notice children’s strengths and watch them flourish and grow.